These are easy to throw together, and take as a last minute gift, or serve up at your next holiday party. These cost so much less to make at home, than to purchase. 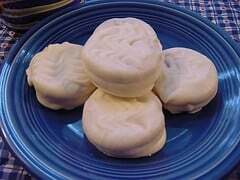 You can make these White Chocolate Oreo at home. Melt white chocolate coating in either a double boiler, or in the microwave. When melting in a microwave glass bowls work the best. When chocolate is melted, use a spreader knife and frost the chocolate coating over one side of the Oreo. Then decorate with toppings of your choice. You may also wish to dunk the Oreo cookie completely into the chocolate as well. Let cookies cool on waxed paper. haven’t tried them yet but looks easy enough. Thanks!!! Pretty easy to do, and much less expensive. These are easy to make I have dipped everything from pretzels, crackers to butter cookies and it so easy and really good! People think you worked so hard and love them. I don’t make pretzels like I used to and I still get request. I have one friend who expects a bag every Christmas! Your friends are very lucky!